Imagine a large chunk of the population suddenly adopted a strange set of beliefs that you couldn’t understand, and that they themselves couldn’t explain. Then imagine that they started arguing with each other over seemingly insignificant details. And they are very serious about it all. Deadly serious. They are prepared to die for their beliefs. And to kill for them. Then they get control of the state, and start fighting each other. Armies are deployed and full scale pitched battles fought over minor points of doctrine. This was the nightmare the pagans of the late Roman Empire had to face with the rise of Christianity. With the backing of Constantine Christianity was triumphant. For now, pagans were tolerated. The emperor was still Pontifex Maximus so on paper was the leader of the pagans. As he no longer had any interest in the ancient beliefs this effectively robbed the pagan faction of a leader. But he was very interested in the issues that consumed the Christians. The main issue that vexed them was other Christians. The arguments, particularly the ones coming out of Alexandria in Egypt, were what led Constantine to summon the council of Nicea. His objective was to get agreement between the different strands of Christianity around which everyone could unite. As planned, an agreement was duly reached, but the unity that this was supposed to create did not follow. The result was the precise opposite. The Council of Nicea is really the start of Christianity as we know it today, making 325 one of those dates that mark a turning point. The Church, uniquely, has a continuous institutional history stretching from the Roman Empire until now and continues to use the language of the empire. There was a lot on the agenda and many important decisions were made. The Bible was regularised into the form we know today. The Christian calendar was arranged creating the cycle of feasts and holidays we are still familiar with. Tolerance was not on the agenda. The council established an orthodox creed which all right thinking men should agree, and anyone not willing to sign up to it became a heretic. And it turned out there were plenty of heretics. The biggest group was the followers of Arius, the troublesome Egyptians who had triggered the whole thing off. They had been present at the council and had unsuccessfully argued their case. But they weren’t the only ones the council ruled on. There were also the Paulists, the Montanists and the Navatians. These were groups who up until then had been members of the Christian republic but who now found that they were no longer mainstream. Then there were the various flavours of the Gnostics who had probably regarded the whole event in Nicea as no doubt interesting, but nothing to do with them. They were soon to find out that rival forms of Christianity were no longer tolerated. There were also people who didn’t have a problem with the Church’s doctrine, but did have issues with its personnel. The classic example here was the Donatists of North Africa. They were in open revolt against anyone who had collaborated with the authorities during the persecutions. This, it turned out, was quite a lot of the top hierarchy of the Church. The battle between the Donatists and the former backsliders who now represented the establishment was to continue for centuries, in fact for as long as Christianity survived in Africa. It soon turned into a violent battle. And in a period of conflicts that generated strong passions it seems to have been the struggle with the highest emotions and the biggest body count. The split in Africa began with a disputed election for the bishop of Carthage, but soon grew into a full scale guerilla war with regular troops deployed in an attempt to maintain order. It isn’t hard to sympathise with the Donatists basic gripe. It must have been galling to see a bunch of toadies hoovering up the new found benefits of royal favour. But their fanaticism soon becomes repellent. Their horror of their co-religionists went way beyond the reasonable. Converts had to be rebaptised. The Donatists would treat any Church that they regained from the authorities as polluted and would purify it with as much energy as they would have expended on a place of idolatry, burning the alter and washing down the walls. They were reckless of their own lives. They would take on the legions in full scale battle armed only with farm implements. They often simply killed themselves in their eagerness for martyrdom, or even more gruesomely ordered passers by to kill them (or be killed themselves). This deep seated insanity was passed from generation to generation and led to death on a horrific scale. This single dispute in a handful of provinces between people who agreed on every point of doctrine and who claimed to be followers of a peaceful and simple preacher was to kill vastly more Christians than all the prior persecution of the Christians by the pagans. But despite their extreme behaviour, the Donatists were orthodox Christians. There were also groups that did not accept the new Nicean creed in the first place. The measures taken against them by the newly empowered orthodox church were pretty severe. In fact, the edicts of Diocletian proved a useful model. It is more than a little ironic that for some Christians the elevation of Constantine led to the return of the persecution that they had been free from for over thirty years. Lets look at the beliefs of the groups the Church found so objectionable. The followers of the long dead Paul of Samosata believed that Christ was born as just a normal man and later was infused with the spirit of God. This seems harmless enough but I suppose it would make children’s nativity plays at Christmas a bit dull. But whatever, they had to go. The Montanists of Phrygia were pretty standard Christians but insisted that directions should come directly from God via continually renewed prophecies rather than from the Church hierarchy. I don’t think we need to discuss what exactly the problem was there. Letting God speak for himself? How could that possibly work. The Novatians were similar to the Donatists in that they denied the right of Christians who had lapsed during the persecution to return to it. They also added an extra twist by denying the Church had the authority to absolve them. So they had to go too. You might remember the Gnostics from a few podcasts back. They had mixed too much philosophy and mysticism into their brand of Christianity and so they too were declared heretics. Given that the Gnostics were all over the shop with their doctrines they weren’t in a good position to mount an effective defence and were rapidly wiped out. It is a shame to say goodbye to the Gnostics. Their interest in other ideas enriched Christianity and they seem to have been a lot less trouble than most of the sects going – as the fact that they didn’t put up a violent resistance shows. I doubt many Christians are still listening, but if you are and you are looking for anyone in the Christian camp whose actions actually match the words of Jesus himself, the Gnostics are your best bet. They at least seem to have followed the turning the other cheek bit, even if they were open to ideas from sources other than the saviour himself. But they weren’t the only ones to dabble in Greek philosophy, as we’ll see a bit later. But the big heresy was Arianism, the reason for the calling of the council in the first place. The followers of Ariaus were comprehensively trounced at the Council of Nicea by the artful Athanasius. He did pull a few stunts which ensured that his views predominated, but the bulk of the Bishops were behind the Athanasius position to begin with anyway. And his views on the nature of Christ to this day all still subscribed to by the mainstream Catholic, Orthodox and Protestant churches. Arius even managed to alienate some of the low level of support he did have when he spoke at the council. As a result, Arius was exiled. His works were burned and possession of them was made punishable by death. But the Arians didn’t give up. Despite their rout at the council of Nicea they managed to get back into favour with Constantine. Constantine on the whole, or at least at first, did not care too much about the details of doctrine, he just wanted everyone to sing from the same hymn sheet. (In this case both literally as well as metaphorically.) He attended the opening sessions to give his seal of approval. He attended some debates but did not take part in them, then left with the proceedings in full flow. Everything about his actions implied that he was behind the council, but that the council itself was free to decide. This was the behaviour of a statesman trusting the experts to sort out the issues and respecting the judgement that they reached. But unhappily, after the council had concluded he seems to have started to take an interest in the actual controversy. Rather than drawing a line under the issue, he gave a further hearing to the Arians and then came to support their cause. With the top man behind them, the Arians might well have succeeded were it not for the efforts of Athanasius, who devoted his whole life to the defence of the Nicene creed, as the creed established at the Council of Nicea is still known. Followers of this creed – which is all mainstream Christians – are even today from time to time referred to as Athanasians. 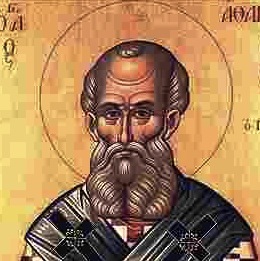 Athanasius had attended the Council Nicea as the representative of the bishop of Alexandria. He had been born in that city of merchant Christian parents who invested in his education. He seems to have been a good student. His learning and erudition were highly developed and he was a skilled communicator. He also had an amazing memory which in pre-Google times was a huge advantage. At one point in his life he was able to carry on a debate about some point of scripture via letters quoting extensively from the Bible even though he didn’t have access to one where he was hiding. He put this huge talent behind his conflict with the Arians. Their dispute about the nature of God and Jesus was as deep and bitter as any in history and was to rock the empire and shape the history of their time and the ramifications of it have still not completely worked themselves out even in our modern world. I have put off talking in detail about the theology behind the dispute as long as possible, but much as I would rather ignore it I can do so no longer. It does have some significance for the rest of the story. I hope I can do it justice. The orthodox conception is of a trinity where the Father, the Son and the Holy Ghost are equal, distinct but the same being. The Arians denied that Christ was fully God and had no need for a Holy Spirit. But both the Holy Ghost and the concept of Jesus as an embodiment of God owe quite a debt to a most surprising source. Both seem to be analogous to the concept of the ‘logos’ developed by the followers of Plato from some ideas in Plato’s writings. Plato had suggested that God had three basic components – a role as the prime mover, as an organising principle that brought order from the chaos and as a soul that pervades the universe and maintains its order. This idea was picked up on by Philo and developed into three individual personifications of God, a form we can recognise as the same as the Trinity. Philo was a highly Hellenic Jew who lived and studied philosophy and religion in Alexandria, where else, in the 1st Century and who fused Platonic thought with the Hebrew traditions. He came up with the idea of the logos as a sort of creative divine force that imposed God’s will on the world. It is a great shame that this mingling of Hellenism and Judaism in Alexandria and the equally eclectic experiments of the Gnostics did not continue. I like to imagine that a hybrid culture could have emerged not unlike the previous polytheism where people could mix, match and take their place on a spectrum of beliefs without having to align themselves with a particular group. If nothing else, a lot of later misery caused by inter-faith conflicts could have been avoided. But from now on maintaining ideological purity was to be the order of the day. And the project to keep the doctrine pure has been enormously successful. I have a feeling that Athanasius could have officiated without too much trouble at any Catholic service up until the 1960s with very little difficulty. But did have difficulties in his own lifetime. Shortly after the Council of Nicea he got the job I imagine he had always wanted of Archbishop of Alexandria. He was only thirty, and it was only three years after the Council of Nicea had endorsed his view of the trinity for the whole empire. Things must have seemed peachy. He set about touring his diocese and getting some flesh pressed. Although he was in a strong position, he still had to reckon with opposition from the party of Arius. Throughout his life he was always a skilled and energetic politician. Strangely he is remembered as a theologian. In fact, as he himself confessed, he didn’t really get the depths of that subject. He writes that the more he thought about the trinity, the less he understood it. He’s not the only one there. Athanasius wasn’t alone in not really understanding the major issue of the day. The disputes about the nature of God rolled on and around. Frequent councils were held to which bishops travelled from everywhere in the empire to argue about it. Factions formed around particular shades of belief and particular interpretations. But despite the extensive discussion did not bring agreement any closer. As is often the way, creeds multiplied. At one stage someone worked out that there were 18 available to choose from. And with Constantine now open to being swayed, there was everything to play for. He had initially been indifferent to which creed was adopted so long as one was agreed. Hear, hear! And had he stuck by the conclusion of the council he himself had called there would at least have been one official doctrine that everyone not greatly troubled by theological details could have subscribed to. turning their attention to the emperor himself were able to progress their cause by other means. The problems really began when Constantine finally came around to the Arian position. Arius was recalled and the persecution of his followers halted. And then the persecution of the Athanasians started, with their bishops being removed on various pretexts. The bishops were still at this time elected, so it wasn’t straight forward to simply remove them. Athanasius himself was one of the first victims. He found himself summoned to a council of bishops at Tyre to face charges of cruelty to the Arians including whipping six of their bishops and killing a seventh, which sounds quite serious, and breaking a chalice in one of their churches which somehow seems a bit below the pay grade for a conclave of bishops. In the event Athanasius turned up well prepared. He took fifty prelates with him to show the level of his support. He also took the supposedly murdered bishop, who he produced to general surprise at a dramatic moment the middle of proceedings. As memorable defences go that must be up there with O.J.Simpson. If you are worried about the chalice, he had evidence to show that the church it was supposed to be in didn’t exist. But the holy men gathered at Tyre weren’t really looking for justice, and after a bit of wriggling Athanasius ended up out of a job anyway. Having sorted out their rival they proceeded on a pilgrimage to Jerusalem. Whether when they got there they reflected on their blatant breach of the ninth commandment hasn’t been recorded. Athanasius was now in the wilderness, both literally and figuratively. He ended up in the Libyan desert hiding in distant monasteries. The Arians were in charge and just before Constantine died he was baptised by an Arian bishop. That the first Christian emperor died as a heretic is a fact rarely mentioned. Arius himself did not get to enjoy much of the triumph of his party. On his return to the court he suddenly died of strange symptoms. We’ll never know if he was actually poisoned by the supporters of Athanasius. Successfully poisoning somebody is far from straight forward so it seems unlikely. But that it was suspected is a pretty clear indication of how far they were prepared to go in pursuit of their cause. But with the death of Constantine the fortunes of Athanasius changed again and he was back as Archbishop of Alexandria. The frequent changes in emperor and the confused state of affairs led to several more exiles for Athanasius. But matters settled down with the final triumph of Constantius. Constantius was an Arian, and used his position to promote that version of Christianity. This was now a problem, because the rank and file of the clergy was now firmly orthodox and the congregations who had elected them tended to support them. Constantius had to impose the Arian doctrine from the top down in the face of determined opposition. Every appointment of a new Arian bishop risked fresh disorder. One occasion in Constantinople illustrates the situation well. Constantius deposed the sitting orthodox bishop by the roundabout means of inviting him to a meeting at the palace and then bundling him onto a waiting vessel and shipping him off to Thessalonica before any of his supporters knew what was going on. When word got out crowds attempted to prevent the consecration of the arian, and fighting broke out. The death toll was in the thousands. A well outside one of the churches was described as overflowing with blood, and not as a metaphor. Athanasius was marked out as the number one enemy of the regime. Once again he was deposed from his seat – this was to happen 5 times in his career – with large numbers of troops deployed to track him down. He evaded capture with lots of colourful stories of lucky escapes. On one occasion the stately church father avoided the men out to take him dead or alive by slipping down a sewer. He also holed up in the house of a well known 20 year old beauty. Apparently a vision had instructed him that this would be a good hiding place, and he duly turned up in the middle of the night and asked her to hide him. He stayed there quite a while. Handy things, visions. Athanasius had many supporters and could slip in and out of Alexandria to send and receive messages to supporters throughout the empire, even though there was an outstanding death sentence pronounced against him by Constantius. So he was able to keep up the struggle against heresy even under these difficult circumstances. Religion had taken centre stage in politics in a way it had never done before, but in which we are very familiar with from news bulletins today. The behaviour of the Christians of this period was a scandal, and indeed it still is. We aren’t talking about isolated fanatics removed from the mainstream here. These are the founding fathers of the modern religion in every sense. Even Christian writers of the time were appalled by what was happening. The pagans were contemptuous and mocked the holy men’s disputes in plays and wrote bitterly complaining of the outrages committed by the sectaries. Gibbon finds a pagan and a Christian agreeing on the ferocity of inter-Christian violence. Quote. The experience of Ammianus had convinced him, that the enmity of the Christians towards each other, surpassed the fury of savage beasts against man; and Gregory Nazianzen most pathetically laments,that the kingdom of heaven was converted, by discord, into the image of chaos, of a nocturnal tempest, and of hell itself. Quite apart from anything else, the obsession of the various emperors of the period, and Constantius in particular, must have distracted them from the more important duty of defending the borders from the inroads of the Persians and the barbarians. The pagans did not suffer direct persecution at this point. They must have been disheartened at the lack of favour from the emperors who were nominally their leaders. Constantine himself had at least skirted around his partiality with some political awareness. His sons, particularly Constantius, seem to have been used as tools of the factions in their courts. But having said that, it is worth remembering that ideological dictatorships often use disputes about dogma and doctrine as a justification for internal repression. Recall Hitler’s Night of the Long Knives and Stalin’s purges. Maintaining the purity of the cause is often a smokescreen for bullying potential rivals and opponents. So it might not have been simple stupidity. But there was one member of the imperial dynasty with his priorities in the right place. The victories of the young prince in Gaul against the Franks and Alemanni resounded around the empire. And he showed no interest in the faction fighting of the Church. For now he kept secret his true beliefs but it may well have been suspected by the pagan majority that with Julian’s known liberal tendencies and love of ancient philosophy, he would look with more favour on the adherents of the gods of his ancestors. If so, they didn’t yet know the half of it. Fantastic episode Colin, thanks. I knew nothing at all about all this. I like to imagine that a hybrid culture could have emerged not unlike the previous polytheism where people could mix, match and take their place on a spectrum of beliefs without having to align themselves with a particular group. Sounds like California, to me. Ho ho ho! Very good Calvus. I have only been in California for about a week, but it seemed like a good place to live in.